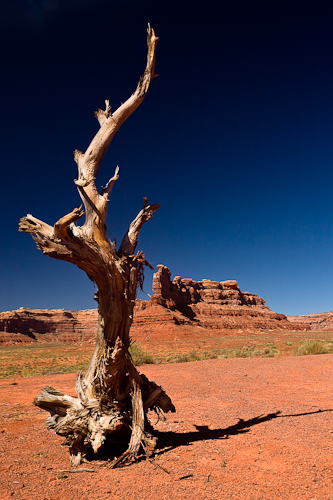 A small 3-day workshop in the Jurassic landscape of Utah, Arizona, Colorado and New Mexico. May is a beautiful time in this region, the Abajo Mountains coming alive with spring flowers and the desert temperatures are still bearable. Our home-base is Abajo Haven Guest Cabins, a private ranch not too far from the town of Blanding, comprising a few log cabins with amazing views of the blue mountains. Three full days of shooting are planned taking in the Arches National Park, Monument Valley on the Navajo Nation’s Reservation and where countless western style movies have been filmed, and Mesa Verde – home of the ancient Native American Puebloan culture. On-location time is emphasized over classroom time, Les will conduct a short talk in the evening, or over lunch on the days when we get back late due to shooting the sunset. The workshop should appeal to all levels of experience and the content of the talk is taylored to the participants needs and requests. Topics such as correct exposure for digital photography and the use of histograms, suitable camera settings such as color space and white balance are covered. For the more experienced photographer we’ll be covering workflow, camera color profiling and the use of ND graduated filters.